How much abuse can this gear take? Portability does not always equal vulnerability for notebook computers and digital cameras. Mobile workers for years have demanded greater durability from hardware that gets jostled on airplanes or accidentally knocked off desks. For the most part, portable devices today can absorb normal wear and tear. The GCN Lab issued a challenge for products that deliver extra ruggedness. Military deployments and emergency disaster response teams have always needed truly tough hardware. Now, ordinary business travelers are buying it in increasing volume. They have learned that a standard notebook or digital camera too often stops working after a brief fumble or a splash of hot coffee. Sometimes data can be recovered; sometimes it dies along with the unit. And that's just in ordinary use. For some government travelers, going out into the field means literally that. Forest Service, Interior Department and Federal Emergency Management Agency personnel find themselves working under the stars, in hot midday sun, beneath thunderclouds or in even more extreme conditions. Military computers must function on the high seas, in rainy jungles, or on the back of transports driving through no-man's land. For users in difficult circumstances, a rugged notebook is essential, even though it costs significantly more than a standard notebook with similar specifications. We took a hard look at two fully ruggedized notebooks and a digital camera, all billed as able to withstand a fairly intense beating. We reviewed Panasonic's CF-17, the Itronix X-C 6250 Crosscountry notebook and the Fuji DS-260HD camera. Notebook components are far more susceptible to shock and motion damage than those in desktop PC systems. The degree of ruggedization can differ. Some rugged models turn out to be only slightly tougher than standard ones, while others can be dropped from a height of several feet or submerged in water without damage. Even more than in the desktop PC market, it takes solid knowledge to get the best deal in a rugged notebook. The Panasonic CF-17 looks like a miniature version of the company's CF-27, which the GCN Lab has driven a Plymouth Neon across with no ill effects [GCN, May 24, 1999, Page 31]. The sleek, matte black magnesium case is exactly the same as the CF-27's. Its ability to take a lot of punishment is obvious. A detachable metal handle makes the CF-17 look a bit like a purse'but one made of a solid block of metal that could serve as a weapon in an emergency. You would not want to get hit with it. For shock testing, we dropped the unit, both powered on and turned off, 20 times from a height of three feet. Each time, depending on whether it was powered during the drop, the CF-17 either turned right on during the next boot cycle or was ready for immediate use when we opened the case. The system did not so much as flinch from the shocks. For moisture testing, we powered it up with screen and keyboard exposed inside a large, sealed cardboard box containing a standard boiling-water humidifier. The notebook stayed inside our instant rain forest environment for one hour while the temperature climbed to 85 degrees. At the end of the hour, the CF-17 did not seem to have minded the humidity at all. It emerged completely covered with condensation, screen saver still running. After we dried the system off, we saw no effects on either benchmark performance or general operation. Only the 'Intel Inside' sticker suffered. It nearly steamed off the case. In the second moisture test, we turned the notebook on and dumped eight ounces of water over the keyboard. The CF-17 continued to work even when we pushed the keys and completely submerged them. And we're glad to report that no one was electrocuted during the testing. In general, everything about the CF-17 is smaller than in other Panasonic models. The screen measures only 8.5 inches. This saves battery life, but it can make graphics such as Global Positioning System maps difficult to read. Our test unit had a 300-MHz Intel Celeron processor, 64M of RAM and a 4.3G hard drive. That's more than enough power to drive most applications, but not enough for some power users. Another limiting factor is that the notebook comes only with Microsoft Windows 95. Our attempts to upgrade to Windows 98 were unsuccessful because of driver conflicts. The biggest limitation turned out to be the small keyboard, about half the size of a regular 101-key desktop unit. We don't have overly large hands, and we couldn't type fast. But the CF-17 weighs only 4 pounds, 5 ounces. That's pretty good considering the rugged aspect. The CF-17's external floppy drive proved to be the least rugged component. The CD-ROM drive was a retrofitted consumer stereo component. It worked fine, but don't drop it. As for the Itronix X-C 6250 Crosscountry notebook, it excelled where the CF-17 fell short but lagged in other areas. The Itronix keyboard has keys close to full size that snap when you type, just like those of a standard keyboard. Plus, the entire keyboard glows in the dark, a feature users have been asking makers to add for years. The glowing keyboard draws no more power than a normal keyboard yet can be used in pitch darkness for up to 30 minutes before the glow starts to fade. Of course you must expose the keyboard to light for a while first, but if you are often in situations where the power cuts off, you can keep working even with no other light. The X-C 6250 was not as rugged in our tests as the CF-17, however. It seemed to choke after being dropped, at one point refusing to reboot. It did come back on, but for about five minutes we thought it was a goner. The unit didn't seem to mind our intense humidity testing but quickly turned off after water was dumped on the keyboard. After drying out, it started working again. So it never actually failed our torture tests but did not completely pass them either. The X-C 6250 has a 266-MHz Cyrix processor, a 3.2G hard drive and a large, 10.5-inch monochrome display. Although the company Web site boasts about how legible the display is, we found it hard to read under normal office lighting and nearly impossible in direct sunlight. The antiglare coating acts like a mirror in certain situations. The X-C 6250 also has optional components for operation with a wireless network, but our test unit was not set up to take advantage of that. Radio communication with a base camp or home office could be a huge advantage for some X-C 6250 users. 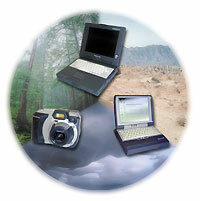 Digital cameras generally tend to be less rugged than notebooks. But Fuji's DS-260HD camera gives good picture quality in an impact-proof, water-resistant casing. Before you buy it to take pictures in unfavorable environments, you should know a couple of things. The tough camera sacrifices compactness for durability and reliability. Almost as large as a single-lens reflex film camera, the DS-260HD weighs about two pounds. Most other digital cameras we've reviewed weigh less than half as much. The DS-260HD did well in our misty and wet environments. It's slow, however, not user-friendly and at times awkward at executing user commands via poorly designed buttons. The camera was designed for use on cloudy or rainy days, and its picture quality was invariably sharp and clear in our tests. The 1.7-inch, charged-coupled-device unit renders 1.5 million pixels in either high-resolution mode, 1,280 by 1,040 dots per inch, or at low-resolution, 640 by 480 dpi. Images are stored in a native JPEG format. The 3X optical zoom is a nice addition. It takes the camera substantial time to process an image. The user must wait about six seconds between pictures. This slow pace also applies to viewing images in play mode. It takes a long while for them to come up, and viewing on an LCD only 1.5 inches by 1.1 inches seems constrained. The buttons are big and bulky, for operating the camera with gloved hands. A large knob on the side determines the mode: set up the camera, play images, take a picture, format media and so on. Although the size of the knob was a good idea, it controls too many choices, making the camera hard to use and understand. Some of the modes could have been grouped together. For instance, in other digital cameras, the erase command is incorporated within the play mode. While you view images, you can erase some of them. Likewise, other digital cameras automatically retain a just-shot picture on the LCD for a few seconds to let you see what you got. The DS-260HD doesn't. When you take a picture, you must switch modes to view it and then switch modes again to erase it. Several users whom we asked to try the camera mistakenly erased all the pictures in the camera instead of selected ones. We think this happened because the menu and execute commands share the same button. Setup mode generally lets you custom-configure a camera or connect it to a computer. But the DS-260HD has a mode for each operation. When was the last time you paid $999 for a peripheral that can't interface with a PC via Universal Serial Bus but is limited to a slow serial connection? In downloading images to a PC, we found it easier to use the optional FD-A2 Flash Path floppy disk adapter. The software setup for the $100 adapter was easy and painless. The power switch, which moves left to right at the back of the camera, made turning the DS-260HD on and off very easy. The lithium-ion battery gave us about five days of intense photography. Recharging took four hours. The flash function was automatic and worked well in low light. Is the DS-260HD rugged? Sort of. It's impact-proof but not really drop-proof. It appears to be designed to withstand small taps and slight hits but not drops. Its true strength lies in a water-resistant shell. We used it unprotected in the rain, and it worked. You pay for good picture quality and water resistance, but you give up speed, ease of use and some design improvements of other, lower-priced cameras. Most of them in the $1,000 range have higher resolution than the DS-260H.